Do you ever start a project and it becomes bigger than you thought it would? I showed you the Candy Boxes yesterday. Yes, I actually made 22 of those things for co-workers. But that's not all I did this weekend...No. I always have to out-do myself, and this time is no exception. I am a team lead for 9 people at my work and I decided to give everyone a stocking to hang outside of their cubicles. Now, I knew I needed to fill them! Cut 4 pieces of decorative paper 3.25" x 3.75"
Cut 2 pieces of chipboard 3.25" x 3.75"
Adhere the paper to both sides of the chipboard. I used double-sided paper and made sure my front and back covers were the same, any my inside covers were the same. I used my bind-it-all and punched out 6 holes in the top. I then bound it with 3/4" wire. I applied adhesive to the back of a post-it book and placed it inside. Embellish the cover however you like! I used paper rosettes and whatever else I could think of. No two were alike. I also whipped up a yummy little bag of home made caramels. I showcased the caramels a couple years back, but they were ready for a redo this year. Before you think, "forget making home made caramels...who has the time or patience?" You better check the recipe out. Did I mention they cook in the microwave?? So easy!! My good friend, Jackie, gave me this recipe and it really is wonderful. - Use a metal pan. pop out of pan in one big block. batch, so 9 rows by 9 rows of about ¾-1” in size. After the caramels were wrapped up, I put them in a clear acetate bag and cut a header out of the matching decorative paper I used for my projects. 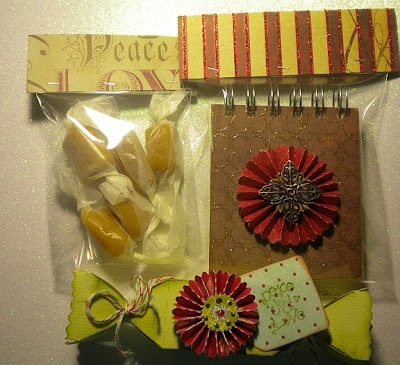 I also put the post-it book in a bag as well, to keep the embellishments on the front nice and sharp for gift giving. It was definitely a busy weekend, but it was really fun. I haven't spent this many hours in my craft room for a very long time! yummmmmmmmmy, I can't wait to do this recipe now. we used different ingredients, not sure how they will turn out. We used heavy whipping cream, brown sugar, white sugar, salt, vanilla. No butter at all. Weird huh? I don't have the patience to do it like that again. Thank you for this recipe I am going to try it for sure.